An Oak Hamper starts Series 900 followed by an eye-catching cedar Butterfly House! Watch the butterflies from the Garden Swing, functional, beautiful and satisfying to build. 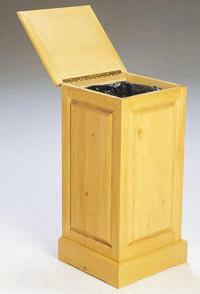 Start recycling in your home with this Recycle Bin a modern necessity. Have time and information at your fingertips with The Data Cube and The Clock Book featured in this series. Next up the Ironing Board Cabinet a project that is attractive and useful! Bob and Rick show you how to make a roll top with a special shop-made fixture used to build the Bread Box. The series concludes with the Patio Planter. Great summer projects included in this series of "the Router Workshop". The first episode of this new series is a two-part project, "The Hamper", a beautiful oak furniture piece for the bathroom. In part 1, Rick works on the lid, the base and the moldings while Bob uses a special router fence to bevel the angle pieces that fit between the front and side panels. In the second part of "The Hamper", Rick and Bob show you how to rout beautiful oak panels for the front and sides of the hamper and how to make and use an egg crate fixture to cut the ventilating holes in the back of the hamper. Join us for "The Hamper" on the Router Workshop. 901. The Hamper, Part 1 902. The Hamper, Part 2 Order E Plan U.S. Customers Click Here! Canadian Customers Click Here! 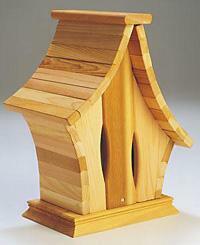 An eye-catching cedar house for butterflies, "The Butterfly House" is the next project on the Router Workshop. Craftsmen, Bob and Rick Rosendahl show you how to use matching bits to shape the wall and roof pieces to fit together in a smooth rounded contour. You'll also discover how to make ellipse openings and shape the gables with pattern fixtures. That's "The Butterfly House" today on the Router Workshop. 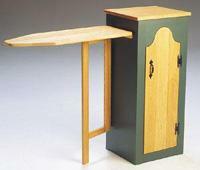 In this episode of the Router Workshop, Bob and Rick produce a unique paneled "Recycle Bin". Slots and splines secure the moldings to the plywood lid. 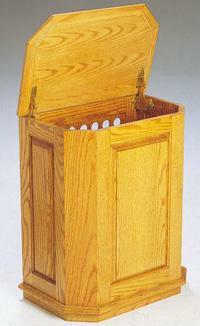 Panels, rabbet/dado joinery and a useful metal bag holder make this "Recycle Bin" a modern necessity. Recycle with this neat container by building your own "Recycle Bin" shown today on the Router Workshop. Bob Rosendahl makes a perfect wooden book that opens to display a picture in the cover and a clock in the "Book Clock". Rick reveals the secret to making perfect circles for the dials in "The Data Cube" and shows you how to mount the cube on a swivel. Have the time and information at your fingertips with "The Data Cube" and "The Clock Book" today on the Router Workshop. Today on the Router Workshop Bob and Rick work with a circle fixture to complete a unique box shaped like a fan. Tolerances are very close when a rotating storage tray disappears inside the half round "Fan Box". Bob and Rick show you how to cut the round and bend plywood to make the sides of the box. A tray with dividers provides storage and rotates inside the "Fan Box" today on the Router Workshop. Up on legs, "The Patio Planter" is suitable for the patio or back yard. It is featured in this program of the Router Workshop. Rick clamps a series of pieces together in a holding fixture and uses a portable router to cut the interlocking knotches in all the pieces at once while Bob routs the leg slots. 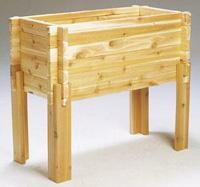 This take-apart planter requires no fastening other than the interlocking joinery to hold it together. "The Patio Planter" is shown on the Router Workshop.